Lamical Perine had a 5-yard scoring catch and 53-yard touchdown run to lead No. 10 Florida’s strong rushing attack Saturday, helping the Gators affirm their return to relevance with a 41-15 rout of No. 8 Michigan in the Peach Bowl. After finishing 4-7 in 2017, Florida enjoyed a dramatic turnaround in Dan Mullen’s first season as coach. “I don’t know many teams that’d be lining up to play us right now,” Mullen said. Feleipe Franks ran and passed for touchdowns to lead Florida’s offense. 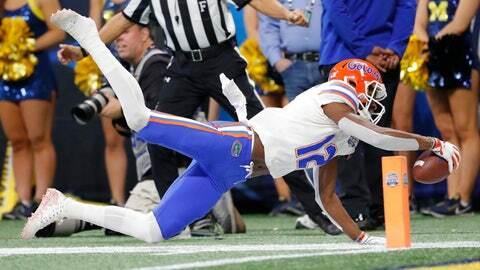 Chauncey Gardner-Johnson led Florida’s defense with two interceptions, including one returned 30 yards for a touchdown with less than five minutes remaining. Gardner-Johnson’s first interception early in the second half, when Florida led only 13-10, set the tone for the Gators. Coach Jim Harbaugh said he thought his Michigan players recovered from allowing 567 yards in a 62-39 loss to Ohio State to close the regular season, ending the Wolverines’ hopes for a spot in the College Football Playoff. Trailing 13-10, Michigan’s first possession of the second half began at its 48. The excellent scoring opportunity was only a prelude for disappointment. The Wolverines gained one first down before Patterson’s deep pass over the middle was intercepted at the 3 by Gardner-Johnson, whose 47-yard return to the Michigan 44 set up the Gators. Speedy Kadarius Toney gained 30 yards on a fourth-down, end-around run to the Michigan 5. Franks’ 5-yard touchdown pass to Perine pushed the Florida lead to 20-10. Florida: From the start, with players bouncing up and down on the sideline, the Gators seemed intent on ending their feel-good season with a win. Florida made a statement it will be a team to watch in the Southeastern Conference’s Eastern Division in 2019 after it piled up big yards on the nation’s top-ranked defense. Michigan: The Wolverines’ loss of talent was evident on both sides of the ball, especially at running back. Tru Wilson made the start as the replacement for Higdon at running back but had only three carries for nine yards. Christian Turner and Chris Evans each had seven carries. The committee approach couldn’t make up for Higdon’s departure. Michigan was held to 66 yards rushing, including 32 by Turner. On the Wolverines’ first possession, Turner’s 46-yard touchdown run was turned into a modest 8-yard gain when the review showed he stepped out of bounds at the Florida 38. Patterson’s apparent 8-yard scoring pass to Tarik Black was taken away in the fourth quarter when the review showed Black lost control of the ball when falling back. Turner, who played in only two regular-season games, will retain his freshman eligibility in 2019 under college football’s new redshirt rule. Shea Patterson’s 9-yard scoring pass to Donovan Peoples-Jones in the first quarter was the Wolverines’ only touchdown. Patterson threw two second-half interceptions and completed 22 of 36 passes for 236 yards and a touchdown.